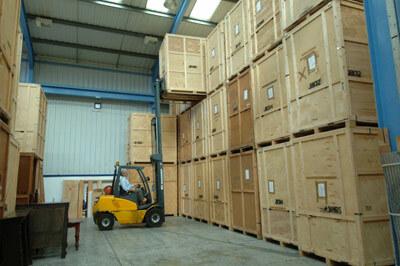 We offer a range of storage services to meet our customers’ differing needs. These include short or long term storage in wooden customised containers. Depending on your individual needs you can access your containers as and when you require or they can be left and closed up for any length of time. Jamie Briggs Removals and Storage is based at Upper Heyford's base where we occupy a 35,0000 sq foot warehouse with 24 hour on site security. We provide secure containerised storage in personal dedicated storage containers which can be accessed at short notice if necessary. Our warehouse is clean and dry and is managed by a dedicated warehouse manager. If you need to remove or add items whilst a container is in storage, it can be opened in your presence and the inventory updated. Click here for details of our student's storage and crate rental..